2018 Search for Miss World Canada began with a special hello at the Edward Village Hotel in Markham. Hello everyone, welcome to the best week of 2018! It rained most of Sunday here in Toronto, and the moisture hung in the air and made for a very humid evening. Sponsors, PR agents, pageant administrators and hotel staff all worked together to set up a half dozen attractions ahead of the official 2018 Opening Ceremonies. Audio speakers, flat screen televisions, popup banners and whole tables full of designer shoes were carefully arrayed in the upscale ballroom of the hotel complex. 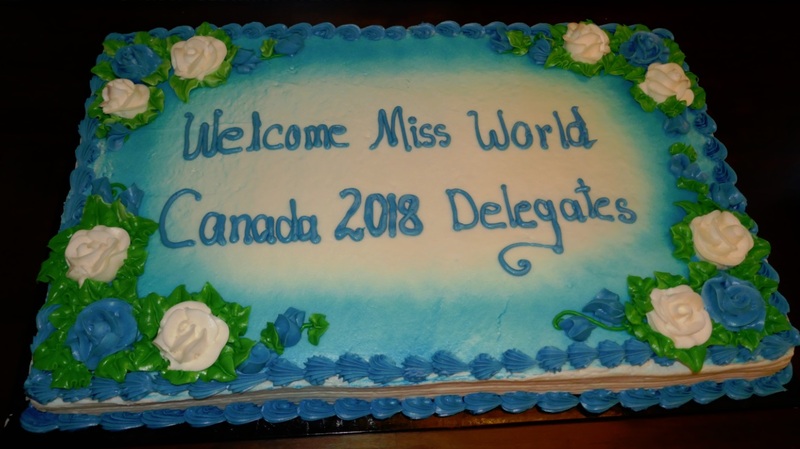 Fifty-six delegates from across Canada showed up on time and mingled with photographers and press in front of a giant Miss World Canada photo wall before a chaperone made an executive decision to open the doors. And in this way The Chocolate Room was revealed. The interior of the spacious ballroom was laid out with tables and chairs ready for speeches, sponsored gifts and an evening of Karaoke song. Minutes later, the pageant director Michelle Weswaldi appeared at the podium and spoke to the assembly. Her standard Hello-and-Welcome to the pageant speech has evolved over the years, and is today equal parts personal empowerment mixed with mutual respect and common sense. Her discourse was followed by a similar soliloquy from the social media director who introduced all the sponsors in the room, but forgot to mention key parts of their messaging. Let’s remember that just getting here is a remarkable achievement; every delegate has a perquisite right to be proud of herself thus far. Not only did they each have to win a local title, but most also had to board a jet and fly thousands of miles. 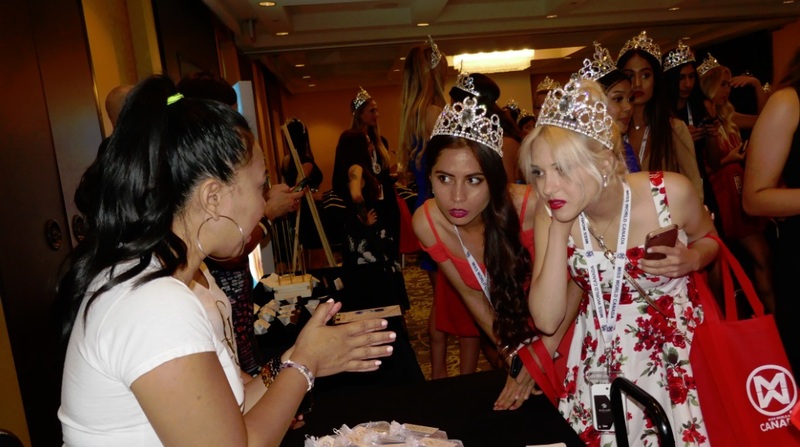 Most delegates came alone, their only friends or people they know are the pageant director and a few of the other titleholders they met once or maybe twice before at regional events in their province of origin. So this Welcome Party serves a real need and special purpose; its done to make every delegate feel welcome and let everyone know they are part of a giant community. In this ensemble they are collectively empowered to watch each other’s backs and be mutually supportive. Upon entering the ballroom, some girls sought out their comfortable home-province pals, while others surveyed the piles of SWAG on display. Most sat patiently waiting for the newly appeared pageant staff to introduce themselves and make public their roles in the production. The first big event on the first big day in a big week of firsts. This is the first day of the first week of their new life as Miss World contenders. Win or lose, history will remember these people. The delegates, each aged between 19 – 25 years old checked in that day, fresh from their hometowns, all-across the nation. And the pageant administrators like to mix them up too; they deliberately put farm girls with city folk and East Coast delegates bunk with West Coast entrants to ensure everyone meets and makes new friends and has a special experience. The t shirts are part of the prescribed exercise outfit for Fitness Day, later in the week, and these were one of the first things the beauty queens were bequeathed; the garments were stored in their big red Miss World Canada brand SWAG bags which they picked up at the start of their mystery tour. The 2018 Welcome Party was full of surprises. There were many wonderful moments as delegates lined up to get gifts and free or heavily discounted beauty services from affiliated businesses. The sponsors are mindful entrepreneurs and personal improvement practitioners with something to share from their ‘brands that care’. There were hand lotions, bath bombs, essential oils and shoes and handmade jewelry. The highlight of the evening was a sing-along Karaoke center. Below is Christina Paruag the founder of FemEvolve health care magazine. This young lady isn’t much older than the delegates, but already she’s an accomplished writer and cancer researcher. She’s also a Judge on Saturday night (and Thursday night at the preliminaries), but she didn’t make that information publicly known before this event. Christina wanted to meet and mingle with the delegates one on one without them feeling like they had to be on their best behavior or in anyway on trial. FemEvolve is all about being authentic and not lying to others or to yourself. 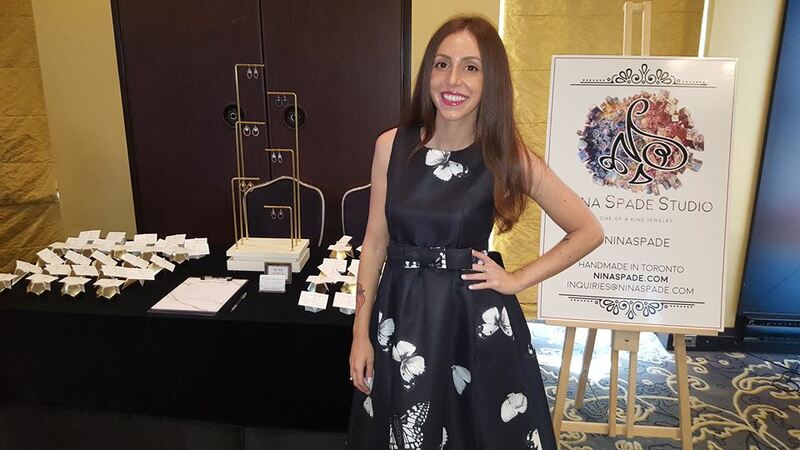 Christina was on hand to share herself, her magazine, and two different essential oils with attendees. She posed for a hundred pictures, only two of which are seen here today, but more images from other sources will almost certainly appear online at FemEvolve com blog in the future. 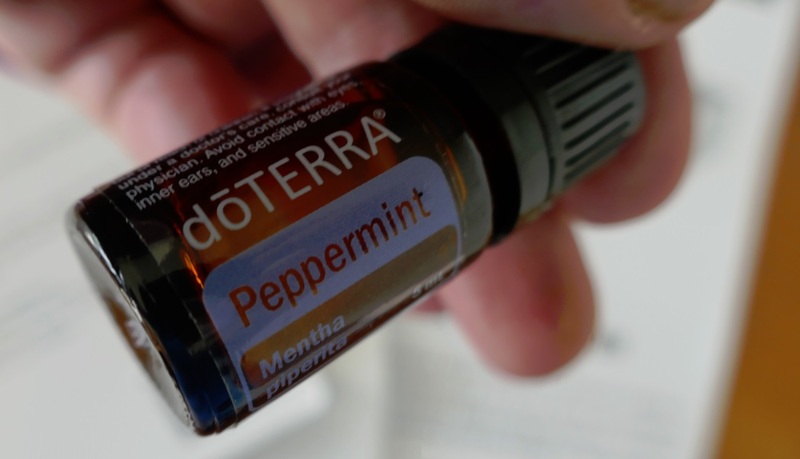 DoTERRA’s peppermint oil is a healthy minty resin used in toothpaste and chewing gum for oral hygiene. Peppermint also helps alleviate occasional stomach upset and promotes healthy respiratory function. Golden Glamour Goddesses on Facebook have many original images and a unique perspective on the evening. Golden Glamour Goddesses had to speak over the music to make their special offer known to the contestants. 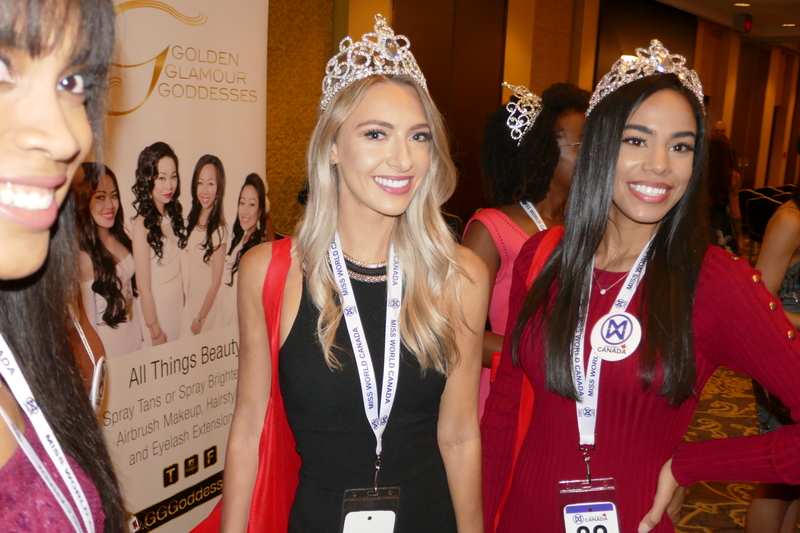 These sisters’ have a top rated mobile beauty business and after being part of the Welcome Party ceremony for many years they are now an official partner of the Miss World Canada organization. So once again these professionals were here offering high quality spray tans and individual eyelash extensions. The ladies signed up to get the treatments later that night and in the immediate future, right here in the hotel. One of the returning sponsors, Standard Telecom – Nortel network phones business debuted a very interesting donation to the pageant. This phone networking company is spending the summer researching a Nortel Legacy project which will be published later in the fall. Nortel Networks was a Canadian company that contributed greatly to telephone office networking in the nineteen nineties and their phones are still popular today. They also developed a lot of technology and secured a great many patents to protect their intellectual property. One or more of Nortel’s technology patents, which were all sold in 2008, directly relate to the rapid-charger mechanism inside the device seen below. 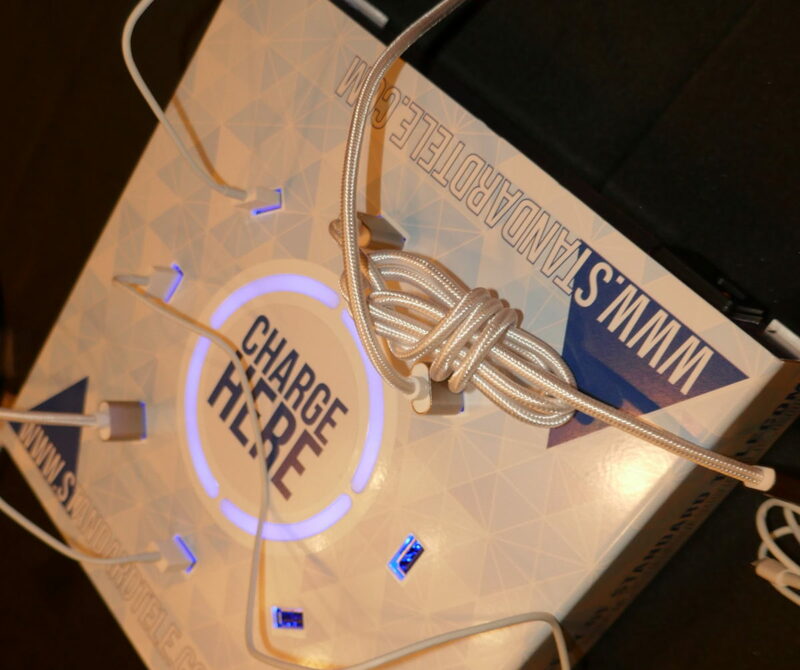 This box is a transformer and rapid charger for lithium-ion batteries (or any smart phone battery). The device below is called (or is manufactured by) Rhinocharge, a Quebec-based company that’s getting global attention with this rig and other bulk-charging equipment. Cynthia Menard, the reigning 2017 Miss World Canada, helped Judy Reynolds of Wandering Minstrel Music School communicate a simple message to the masses when she handcrafted the call-to-action for their karaoke attraction. Judy made her own message later on Instagram. 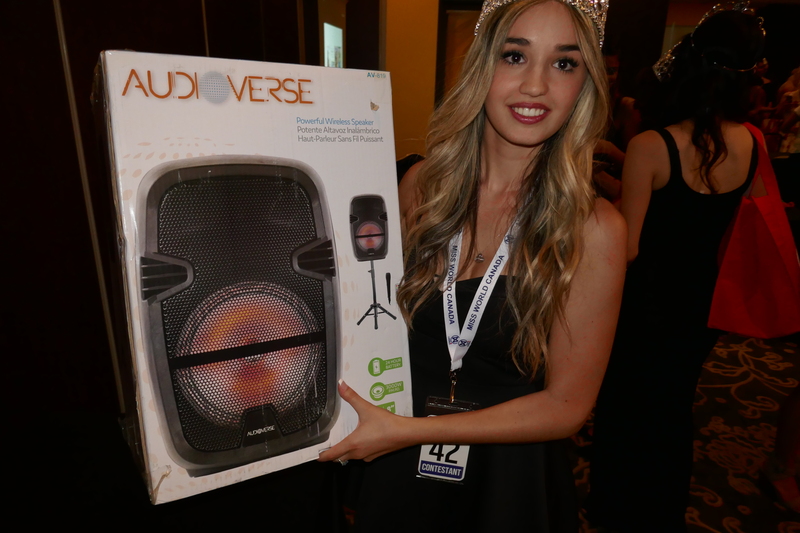 The prize in this mini user-submitted talent contest is a giant Audioverse brand cordless microphone and speaker. Readers can see the entire battle that has enfolded, and listen to all the musical contenders on the #SingMWC2018 Instagram tag. Brett L Tyrala from the Karaoke Center appeared with a handsome rig that was absolutely stuffed with music. 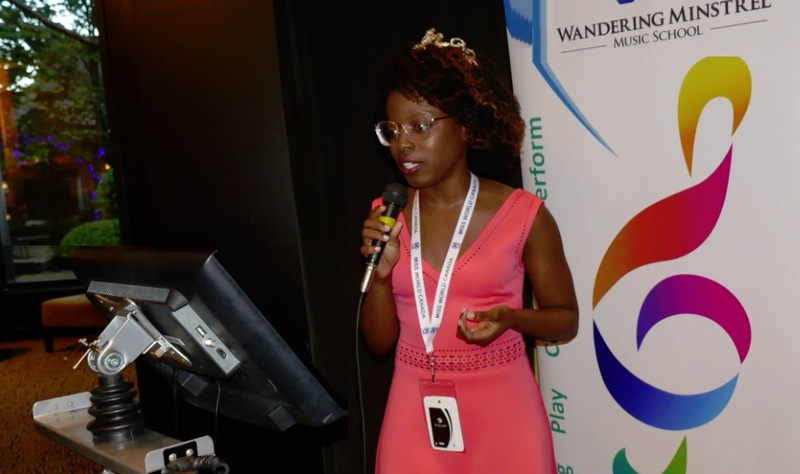 There were over 8600 songs on file, and that was just too many choices for some delegates who went into analysis paralysis and subsequently missed their window to perform. Does this girl look like Adele? Well, she sure did sound like her. Our many songstresses’ ballads were as sweet as this custom monogrammed vanilla mint cream honey cake. Put everything together and it was a pretty special start to our spectacular week.